Perhaps we made a mistake not including this bedroom trend in our Popular Bedroom Renovation Ideas article, but the idea of an Open Plan Bedroom for your master bedroom layout seems to have taken over the market, especially the minimalistic sector of it. Just like your favourite hotel rooms, this design features a bedroom and bathroom in one room for the purpose of convincing and minimalistic style. Typically this layout would include lots of white and grey colours to further accentuate the design choice and it, because typically bathrooms are white so it follows this common trend too so at the very least things, aren’t too dissimilar of that of a normal bathroom area. 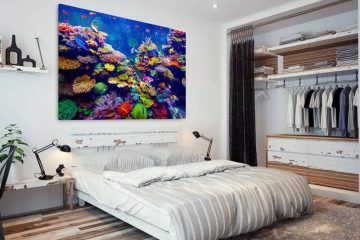 Since we think it’s going to be one of the upcoming and most popular trends of 2019, we urge you to consider featuring a bedroom and bathroom inside your home too, which of course a design choice such as this should only be accomplished after some serious consideration once looking at the drawbacks as well as how it has turned out for other homeowners. 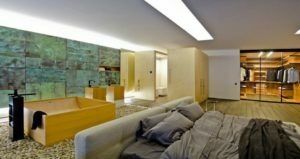 Due to the totally fresh take on modern homes, having a bedroom and bathroom in one room has limitations, so there are a few things you need to consider before you start drafting up your ideas for your latest bedroom renovation. Below are some of the most important things you should consider that could affect the renovation process as well as the aftermath of such design choice. Low Privacy: As you may have gathered, the amount of privacy you have is far, far significant to that you’d have in a normal bedroom and en-suite setup. This is a major problem if you’re someone who likes to take in the alone time whilst been in the bath and if this is also the one and only bathroom in the home, you certainly won’t have any real privacy whether you’re in the bedroom or the bathroom section. Lack of Storage: Now we all have clutter in our bedroom wardrobes and cabinets, but to really take on the whole minimalistic design, you need to get rid of some of that unnecessary stuff that sits in your wardrobe all day, so you are able to have less storage units which will help to emphasise your new bedroom design. Now we aren’t suggesting to simply get rid of this stuff, as we know some of this ‘unnecessary stuff’ are actually items that have some form of memory associated with them, so we recommend using services like WhatStorage to keep your belongings safe. Irreversible: This isn’t your ordinary bedroom makeover, where you slap on some new paint and change the decor of your bedside tables, this is a major protect that is somewhat irreversible and if it is it will cost you a fair deal to get the bedroom you once had back. That’s why, you need to consider these limitations and do your own research to truly see if you are going to be in love with an open bedroom plan like many people are in 2019.